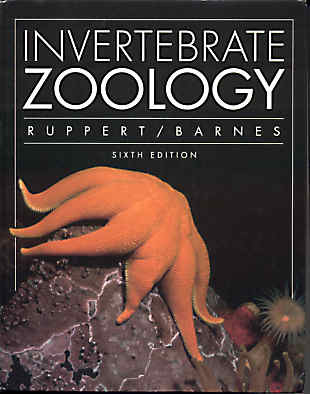 A very popular and authoritative college text, Invertebrate Zoology presents a thorough survey of one the most extensive areas of organic life. When you realize that 95% of life on earth is invertebrate the importance of this subject becomes clear. "Ruppert and Barnes" is full of easy to read text and beautiful line drawings and photographs (no color). The authors provide general features, anatomy, physiology, life histories etc. of the invertebrates with many details of natural history as well as the usual technical materials on biochemistry, evolutionary schema, taxonomic keys, and references to the literature. They start with the protozoa and move systematically through the diverse "higher" taxons such as jellyfish, worms, molluscs, crustaceans, spiders, insects, sea urchins, etc. This book presupposes a basic familiarity with biological concepts and terminology such as cellular metabolism but could be tackled by a very determined beginner. It covers so much territory in detail that it can also be used as a basic reference work . This book is expensive ($95.00 USD) if you buy it new, but used copies in good condition are easy to find in the $50 range. Make sure you get the latest, extensively revised (1994) sixth edition.